Alongside the launch of AMD’s Ryzen 7 CPUs last March, Gigabyte released their take on AMD’s X370 chipset called GA-AX370-Gaming5. This article is a review of that motherboard. You can find it here on Gigabyte’s website and on Amazon for $190. 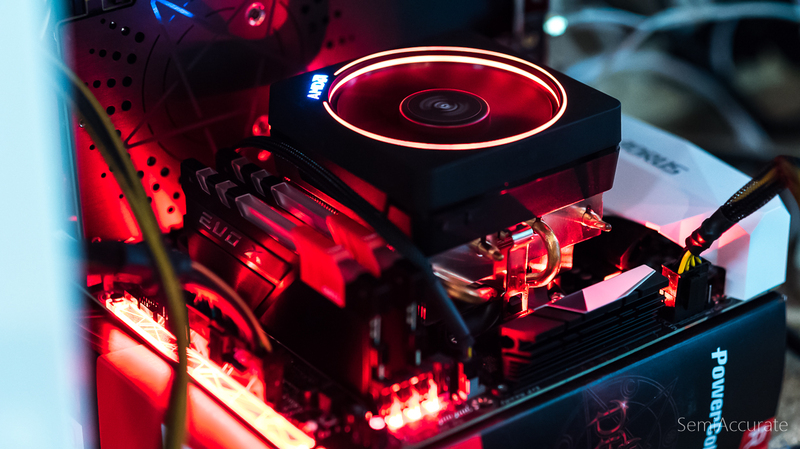 The Gaming5 makes the most out of the full ATX form factor by offering a three physical PCI-E x16 slots in a descending order of x16, x8, x4 electrical connections. This is backed up by three PCI-E x1 slots for WiFi cards and an NVMe x4 bay for fast storage. 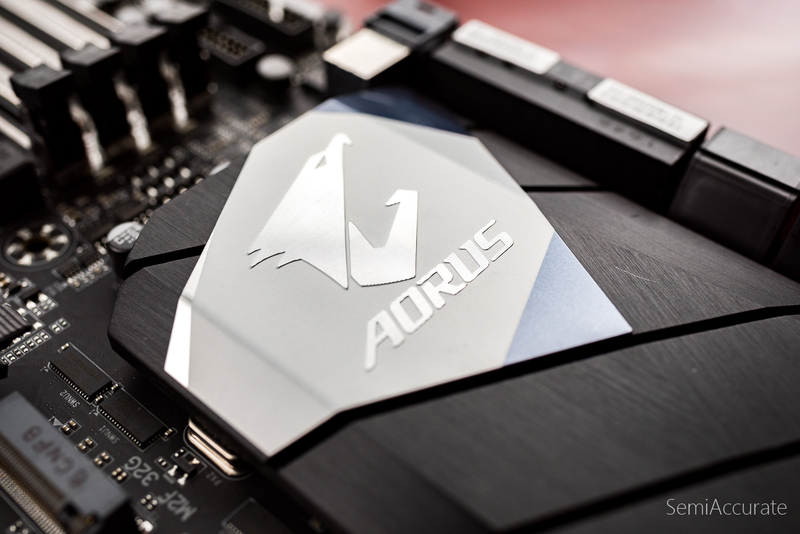 All three of the PCI-E x16 slots on this motherboard use Gigabyte’s re-enforced slot design called the AORUS PCIe Shield by the company. 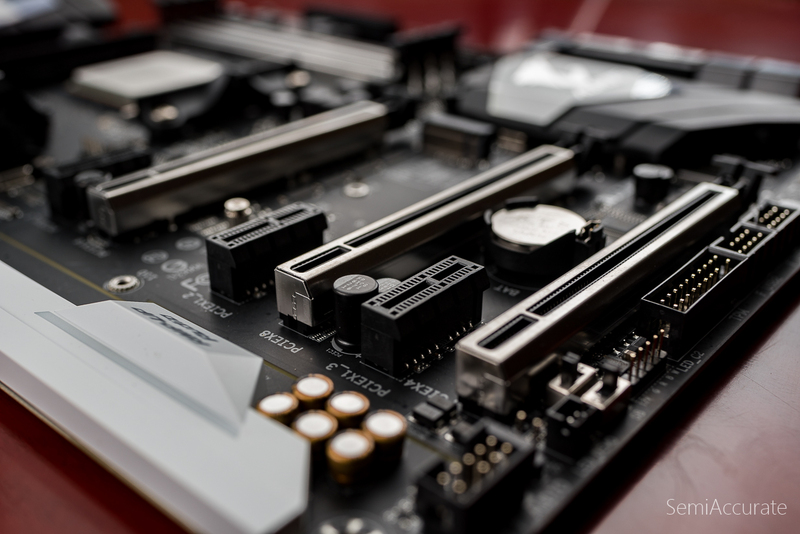 Essentially it’s a one piece stainless steel brace that surrounds the PCI-E slot and is soldered onto the motherboard. 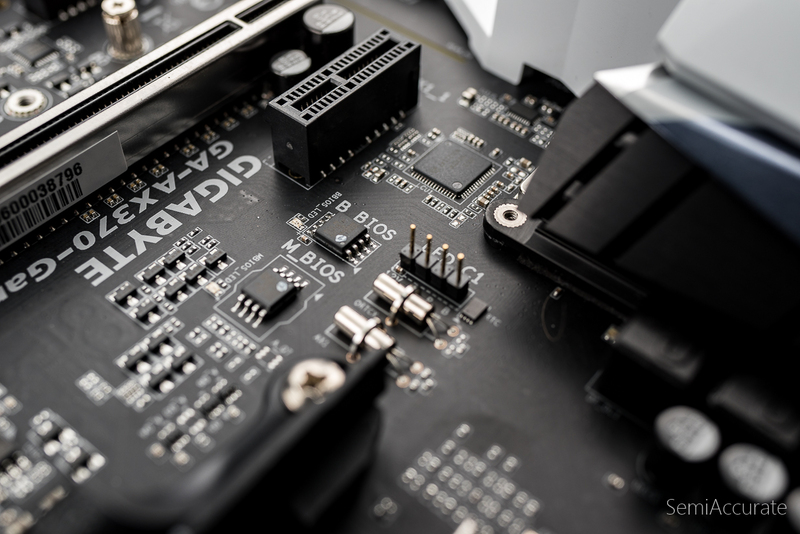 According to Gigabyte’s testing this makes the slot’s retention power 3.2 times stronger and almost doubles its resistance to sideways shearing. As any one who’s accidentally damaged a PCI-E slot by attempting pulling out a graphics card that was still locked into it can tell you, it’s an experience that’s best avoided. Gigabyte also doubled down on re-enforced slots on the Gaming5 by extending this feature to the memory slots. The advantage to braced memory slots is a reduction in PCB flex improved resistance to EM interference. 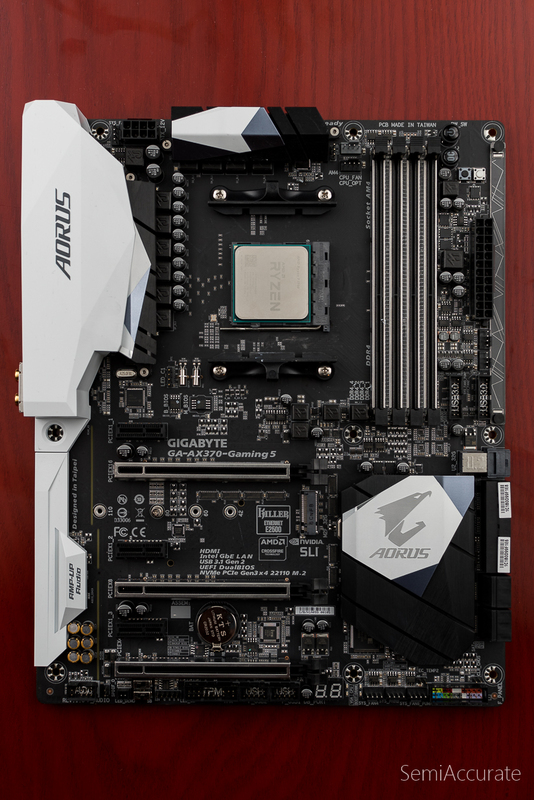 Like pretty much any Gigabyte motherboard the GA-AX370-Gaming5 has dual UEFI BIOSes which have come in hand on any number of occasions when I’ve had a bad BIOS flash happen or an overclocking failure. 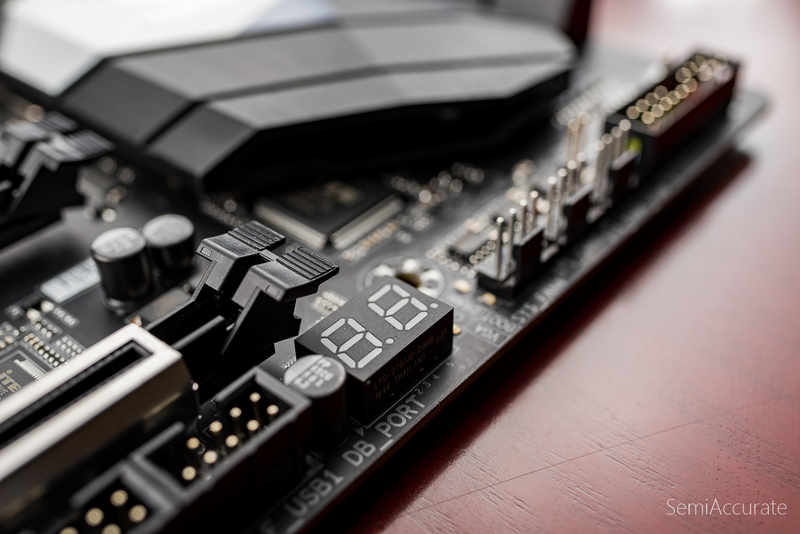 All of the fan headers on this board are of the four-pin type which is a nice touch that enables better control over the cooling of the motherboard and support for high current fans and even watercooling pumps. To get a more accurate picture of temperatures inside of the case Gigabyte’s included two external temperature sensors on the Gaming5. One’s located on the bottom right hand corner of the motherboard near the front panel I/O headers and the other is near the middle of the motherboard by the ATX power connector. 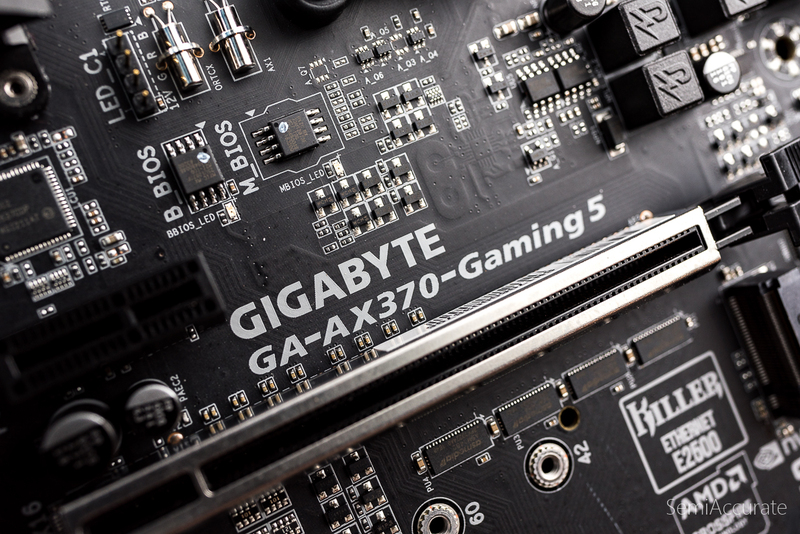 The motherboard makers have really been focusing on audio as a point of differentiation the last few generations and Gigabyte’s GA-AX370-Gaming5 is no exception to that trend. It has two ALC1220 audio codec chips. One dedicated to the rear panel audio and one dedicated to the front panel. This is coupled with dual headphone AMPs that detect the impedance of whatever you plug in and adjusted themselves accordingly. The Gaming5 has a USB DAC-UP 2 feature that improves the consistency of voltage supply over USB cables and cuts the signal to noise ratio in half compared to conventional USB power supplies. Like most X370 motherboards the Gaming5 has, an at first strange, combination of a Killer E2500 Gigabit NIC and an Intel Gigabit NIC. 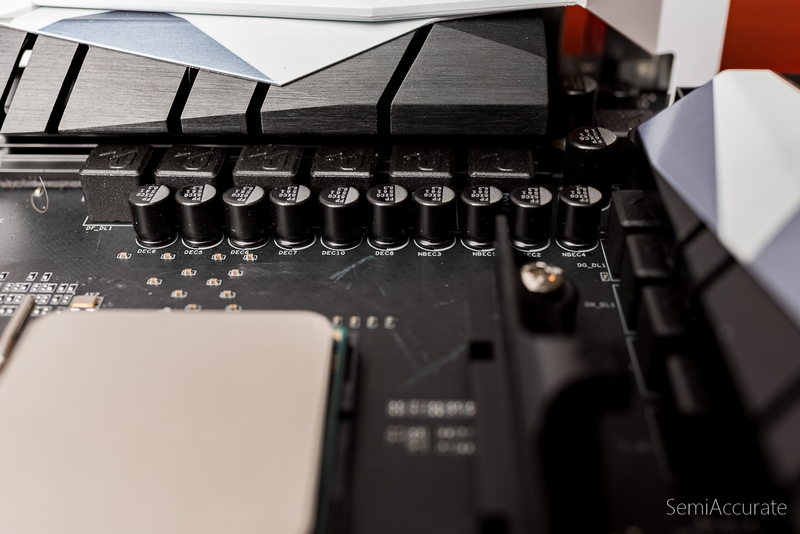 The Killer NIC offers better performance for games because of its intense focus on QoS while the Intel NIC offers a degree of compatibility thanks to being a nearly ubiquitous feature on modern motherboards. 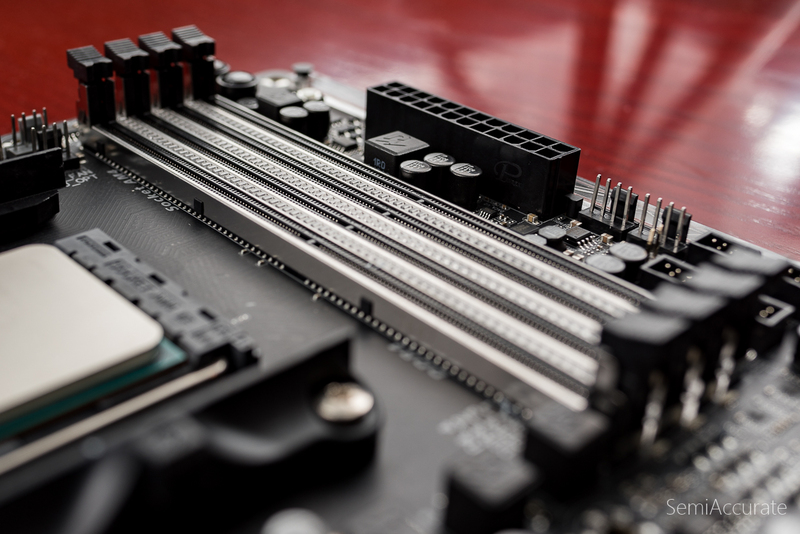 The GA-AX370-Gaming5 is a bit unusual in that it offers a U.2 connector in addition to a standard M.2 connector for hooking into NVMe x4 storage drives. Along side this we have four USB 3.1 Gen2 ports, one with a USB Type-C connector, and the others with Type-A connectors. 6 USB 3.1 Gen1 ports and 4 USB 2/1.1 ports. There are also two SATA Express connectors or 8 SATA III ports. Take away here is that the Gaming5 has no shortage of I/O options. 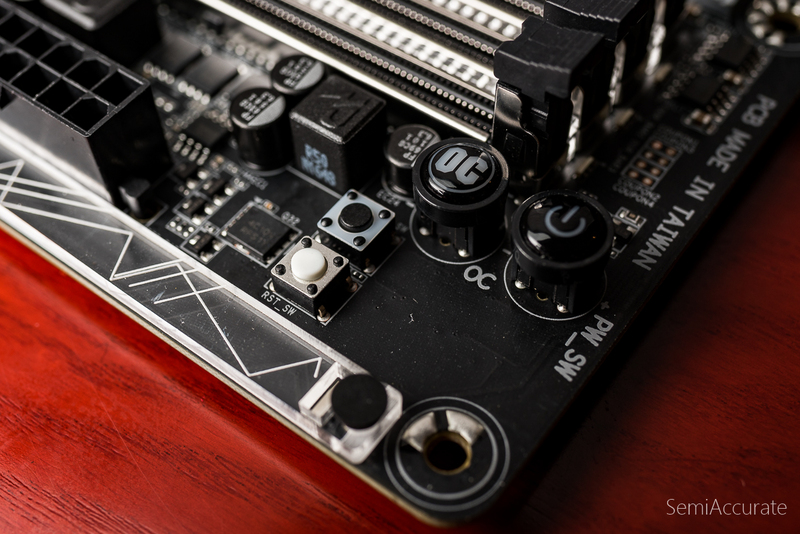 Looking at memory support the Gaming5 is a little different from most AM4 motherboards in that it supports up to 64 GBs of ECC memory if you’re into that kind of thing. Otherwise it support the typical slew of Ryzen memory speeds with overclocking up to 3200 Mhz. As far as system troubleshooting and usability go the Gaming5 has the two features I always look for in a good motherboard: and error code reader and physical power + reset buttons. These two features make solving configuration issue drastically easier and make the Gaming5 a pleasure to work with in an open air test-bed environment. The Gaming5 also has four diagnostic LEDs to visually show you what component the POSTing process is failing on. I’ve found these to be some what useful for troubleshoot GPU issues, but the error code reader does the same thing with more precision. So I’m not entirely sold on the utility of this feature yet. Maybe that will change with time. Color coded front-panel I/O headers are also a nice user-focus feature. Plugging into those button headers is always a pain and clear labeling goes a long way towards easing that pain. The GA-AX370-Gaming5 uses a robust 6 + 4 phase power delivery system with IOR controllers. It’s not a record setter or anything, but it will deliver plenty of good quality power for any air or water overclocking you may want to do.